Ammonium nitrate is a chemical compound, the nitrate salt of the ammonium cation. It has the chemical formula NH4NO3, simplified to N2H4O3. It is a white crystal solid and is highly soluble in water. It is predominantly used in agriculture as a high-nitrogen fertilizer. Its other major use is as a component of explosive mixtures used in mining, quarrying, and civil construction. It is the major constituent of ANFO, a popular industrial explosive which accounts for 80% of explosives used in North America; similar formulations have been used in improvised explosive devices. Many countries are phasing out its use in consumer applications due to concerns over its potential for misuse. Ammonium nitrate is found as a natural mineral (gwihabaite — the ammonium analogue of saltpetre, which is correctly called niter, and other nitre minerals such as sodium nitrate known as nitratine) in the driest regions of the Atacama Desert in Chile, often as a crust on the ground and/or in conjunction with other nitrate, iodate, and halide minerals. Ammonium nitrate was mined there in the past, but virtually 100% of the chemical now used is synthetic. Ammonia is used in its anhydrous form (i.e., gas form) and the nitric acid is concentrated. This reaction is violent owing to its highly exothermic nature. After the solution is formed, typically at about 83% concentration, the excess water is evaporated to an ammonium nitrate (AN) content of 95% to 99.9% concentration (AN melt), depending on grade. The AN melt is then made into "prills" or small beads in a spray tower, or into granules by spraying and tumbling in a rotating drum. The prills or granules may be further dried, cooled, and then coated to prevent caking. These prills or granules are the typical AN products in commerce. The products, calcium carbonate and ammonium nitrate, may be separately purified or sold combined as calcium ammonium nitrate. Ammonium nitrate is also formed in the atmosphere from emissions of NO, SO2, and NH3, and is a secondary component of some PM10 particulates. The type V crystal is a quasicubic form related to caesium chloride, the nitrogen atoms of the nitrate anions and the ammonium cations are at the sites in a cubic array where Cs and Cl would be in the CsCl lattice. Ammonium nitrate is an important fertilizer with the NPK rating 34-0-0 (34% nitrogen). It is less concentrated than urea (46-0-0), giving ammonium nitrate a slight transportation disadvantage. Ammonium nitrate's advantage over urea is that it is more stable and does not rapidly lose nitrogen to the atmosphere. Ammonium nitrate is not, on its own, an explosive, but it readily forms explosive mixtures with varying properties when combined with primary explosives such as azides or with fuels such as aluminum powder or fuel oil. Ammonium nitrate-based explosives were used in the Sterling Hall bombing in Madison, Wisconsin, 1970, the Oklahoma City bombing in 1995, the 2011 Delhi bombings, the 2011 bombing in Oslo, and the 2013 Hyderabad blasts. In November 2009, a ban on ammonium sulfate, ammonium nitrate, and calcium ammonium nitrate fertilizers was imposed in the former Malakand Division—comprising the Upper Dir, Lower Dir, Swat, Chitral, and Malakand districts of the North West Frontier Province (NWFP) of Pakistan—by the NWFP government, following reports that those chemicals were used by militants to make explosives. Due to these bans, "Potassium chlorate — the stuff that makes matches catch fire — has surpassed fertilizer as the explosive of choice for insurgents." 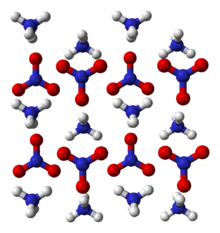 Ammonium nitrate is used in some instant cold packs, as its dissolution in water is highly endothermic. It also was used, in combination with independently explosive "fuels" such as guanidine nitrate, as a cheaper (but less stable) alternative to 5-aminotetrazole in the inflators of airbags manufactured by Takata Corporation, which were recalled as unsafe after killing 14 people. Health and safety data are shown on the safety data sheets available from suppliers and found on the internet. In response to several explosions resulting in the deaths of numerous people, U.S. agencies of Environmental Protection (EPA), Occupational Health and Safety (OSHA) and the Bureau of Alcohol, Tobacco and Firearms jointly issued safety guidelines. Heating or any ignition source may cause violent combustion or explosion. Ammonium nitrate reacts with combustible and reducing materials as it is a strong oxidant. Although it is mainly used for fertilizer, it can be used for explosives. It was sometimes used to blast away earth to make farm ponds. Ammonium nitrate is also used to modify the detonation rate of other explosives, such as trinitrotoluene in the form of amatol. Numerous safety guidelines are available for storing and handling ammonium nitrate. It should not be stored near combustible substances. Ammonium nitrate is incompatible with certain substances such as chlorates, mineral acids and metal sulfides, contact with which can lead to vigorous or even violent decomposition. Ammonium nitrate has a critical relative humidity of 59.4%, above which it will absorb moisture from the atmosphere. Therefore, it is important to store ammonium nitrate in a tightly sealed container. Otherwise, it can coalesce into a large, solid mass. Ammonium nitrate can absorb enough moisture to liquefy. Blending ammonium nitrate with certain other fertilizers can lower the critical relative humidity. The potential for use of the material as an explosive has prompted regulatory measures. For example, in Australia, the Dangerous Goods Regulations came into effect in August 2005 to enforce licensing in dealing with such substances. Licenses are granted only to applicants (industry) with appropriate security measures in place to prevent any misuse. Additional uses such as education and research purposes may also be considered, but individual use will not. Employees of those with licenses to deal with the substance are still required to be supervised by authorized personnel and are required to pass a security and national police check before a license may be granted. Health and safety data are shown on the material safety data sheets, which are available from suppliers and can be found on the internet. Ammonium nitrate is not hazardous to health and is usually used in fertilizer products. 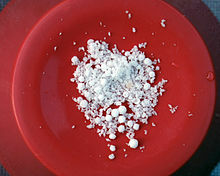 Ammonium nitrate has an LD50 of 2217 mg/kg, which for comparison is about two-thirds that of table salt. Ammonium nitrate decomposes into the gases nitrous oxide and water vapor when heated (not an explosive reaction); however, it can be induced to decompose explosively by detonation. Large stockpiles of the material can be a major fire risk due to their supporting oxidation, and may also detonate, as happened in the Texas City disaster of 1947, which led to major changes in the regulations for storage and handling. The explosion happens by the mechanism of shock-to-detonation transition. The initiation happens by an explosive charge going off in the mass, by the detonation of a shell thrown into the mass, or by detonation of an explosive mixture in contact with the mass. The examples are Kriewald, Morgan (present-day Sayreville, New Jersey), Oppau, and Tessenderlo. The explosion results from a fire that spreads into the ammonium nitrate itself (Texas City, Brest, Oakdale PA), or from a mixture of ammonium nitrate with a combustible material during the fire (Repauno, Cherokee, Nadadores). The fire must be confined at least to a degree for successful transition from a fire to an explosion (a phenomenon known as "deflagration-to-detonation transition"). Pure, compact AN is stable and very difficult to ignite, and numerous cases exist when even impure AN did not explode in a fire. ^ Martel, B.; Cassidy, K. (2004). Chemical Risk Analysis: A Practical Handbook. Butterworth–Heinemann. p. 362. ISBN 1-903996-65-1. ^ Choi, C. S.; Prask, H. J. (1983). "The structure of ND4NO3 phase V by neutron powder diffraction". Acta Crystallographica B. 39 (4): 414–420. doi:10.1107/S0108768183002669. ^ "Nutrient Content of Fertilizer Materials" (PDF). Archived from the original (PDF) on 2012-12-24. Retrieved 2012-06-27. ^ a b Cook, Melvin A. (1974). The Science of Industrial Explosives. IRECO Chemicals. p. 1. ASIN B0000EGDJT. ^ Potassium chlorate — the stuff that makes matches catch fire — has surpassed fertilizer as the explosive of choice for insurgents. ^ Pradyot Patnaik (2002). Handbook of Inorganic Chemicals. McGraw-Hill. ISBN 0-07-049439-8. ^ Fertilizers Europe (2006). "Guidance for Compatibility of Fertilizer Blending Materials" (PDF). ^ Ammonium Nitrate-Regulating its use, Balancing Access & Protection from "Worksafe Victoria". Archived from the original on 2011-03-11. ^ a b CF Industries. "Ammonium nitrate MSDS" (PDF). Archived from the original (PDF) on 2014-03-27. ^ "Chemicalland21 – Ammonium Nitrate". Archived from the original on 2012-01-10. ^ "Ammonium Nitrate". Paton Fertilizers Pty Ltd. 2005. ^ "Material Safety Data Sheet, Ammonium nitrate MSDS". Properties: UNIDO and International Fertilizer Development Center (1998), Fertilizer Manual, Kluwer Academic Publishers, ISBN 0-7923-5032-4.